As regular readers of the blog know, for some time now I’ve been fascinated with Mt. 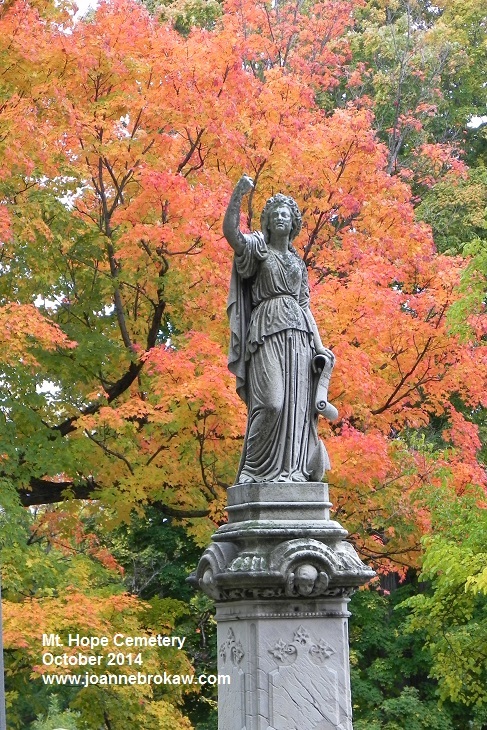 Hope Cemetery – the geography, the peace, the history, walking the dogs there. It’s spurred my own genealogical research but also research into some mysteries and murders, locals ties to national stories, interesting stories about everyday people and just random weirdo stories. I’ve blogged about my adventures in the cemetery and I’ve always been surprised by the number of people who are as fascinated as I am with the things I uncover. The likely spot where Emma Moore’s body was found in 1855. The circled area is all parking lots and buildings now. For a couple of years I’ve been doing some research on three women who died in our area in the 1800s. Just everyday women, but their stories really stuck with me. One of them is Emma Moore. Regular readers know that I’ve been taken with the story of the single woman who disappeared in November 1854. Her disappearance sparked a city-wide panic; the mayor refused to investigate, insisting she left town of her own accord. Her family had no reason to believe she was leaving town, and they feared the worst. The citizenry rose to the occasion and formed committees to do their own investigation. Thousands of people assisted. Rumors of screams heard near her home that night sparked committee members to question witnesses all the way to the lake. A line search was conducted from Brown’s Race to Irondequoit Creek. Her body was found in March 1855, in one of the races that powered the saw mills. She was about six months pregnant, and it’s believed her body may have been there the entire time. 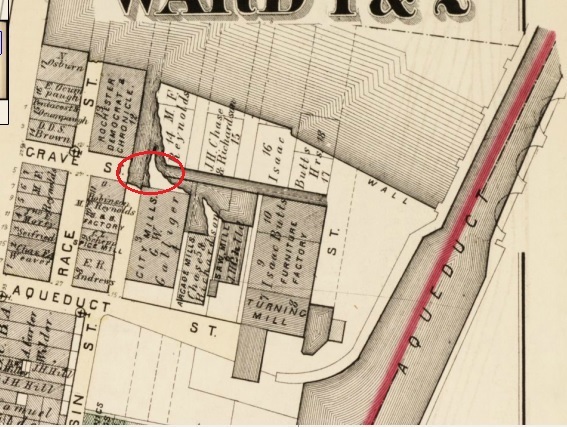 I’ve wanted to find the place where her body was found, but for a long time all I had to go on was “in the race, behind the Thorne Building.” No one seemed to know where that was; the Thorne Building wasn’t on any maps. I tried the library, the landmark society, maps. I just didn’t have enough information to go on. If I’m being honest, I didn’t really try that hard; I had a lot of news stories to read through, and other women I was also researching. But I always had Emma Moore in the back of my mind. About six months ago, I started going through the mounds of research I’d amassed over the last year, and found a very detailed description of where her body was found – down to the direction of race, how many rods in distance from the post office, what the walkway over the race was made of. I had details; now I needed to find a map. This weekend was the annual River Romance along the Genesee River, so I took advantage of the chance to explore the city, from the river to the rooftops of the library. Today, I brought along my new information about where Emma’s body was found. And while on the tour, the guide, Hal, pointed to an area where he thought the mill races used to be – where we were standing, in a parking lot. Later, he emailed me a map detailing the buildings I’d mentioned, all from the new research I’d just waded through. The map is from 1875, twenty years after Emma’s body was found. I probably didn’t even bother to look at that map when I was researching in the library, thinking too much had changed since 1855. But low and behold, there it is. The spot where Emma Moore’s body was found. There’s still a question about whether she lay there the entire four months, or if her body washed there from farther up the river or race. Or if it might have even been held someplace else and dumped there during the winter. I have stacks of research to still read through. But for now, I’m happy to find the spot where she was found. I’ll be going back to snoop around.